Preparing for taxes is a stressful time. Workforce management software can relieve that stress and make tax preparation easier. WFM software offers three important tax benefits that will help your business. Each of these benefits will help you prepare for tax season before the crunch. They will also help you optimize the tax preparation process and finish with fewer errors. Getting your business ready for the tax season can be a harrowing experience. There are lots of things to worry about, and deadlines and penalties only add to the stress. As you start your tax preparation, you’ll begin by assembling employee records. Employers must prepare and send W-2 forms to each employee before January 31. Finding records and transferring them to tax systems can take time and is prone to errors. This doesn’t help the building panic, that’s for sure. Next, your business must prepare the corporate tax filing. This can be a hectic scenario of collecting and organizing records. Almost every employer experiences the “what-if’s” during this time. We worry what we have missed if everything is on time, or what we could have done differently. It’s not uncommon to realize that you missed an opportunity to optimize through the year. Adding to the pressure is the race to get our personal taxes in order. This can place more burden on the business as employees seek personal history data. 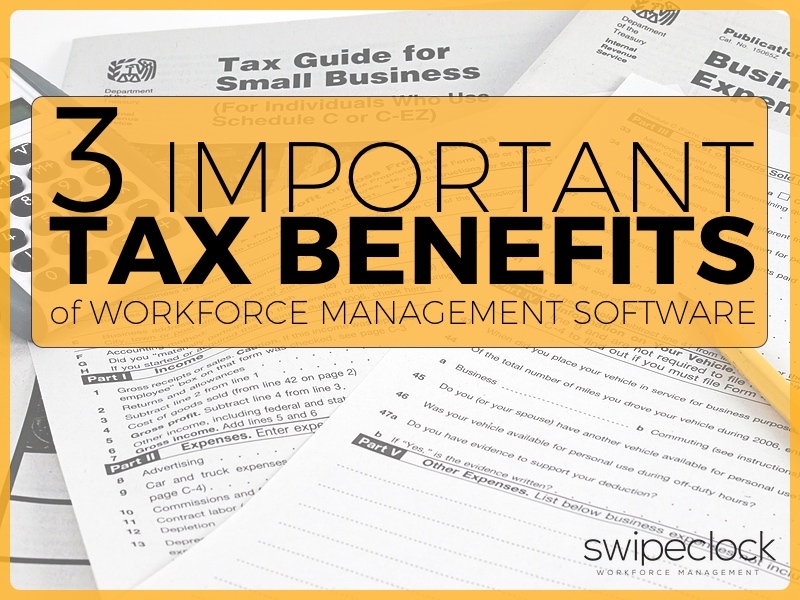 Workforce management software, or WFM software, can help you with tax prep. Companies that use WFM software enjoy automatic preparation for tax season. Records are accurate and in place, ready to reference, print or file. There are many advantages to using WFM software. Time and attendance, scheduling and document management are only a few. But there are also specific advantages of WFM software in your tax preparation. Among them are three distinct tax benefits that will help your company save time and money. Time and attendance is at the heart of your tax preparation. W-2s and other reports rely on your time tracking records. Its critical that these records be accurate and up-to-date. Failure to produce accurate time and attendance records can result in fines. Nobody likes fines. WFM software helps your business record accurate time and attendance data. Intelligent clock-in and conditional lock-outs enforce time and attendance policy. Integration with clock hardware means employees have more options for recording time on the job. WFM software makes it easy to collect and store accurate time and attendance data. Having accurate time and attendance tracking records are only half the problem. What good are they if you can’t get to them? —Not much. Time and attendance records need to be accessible to managers and employees. WFM software not only provides accurate time and attendance tracking but also access. With WFM software, managers have real-time access to employee time and attendance data. Employees also have real-time access to their own W-2 data. In fact, with employee self-service access, employees can track their own records. HR managers are free to work on more important corporate tax preparation. Managers don’t have to spend valuable time hunting for employee records. Tax season is difficult because there are so many questions to be answered. Most of those questions have to do with historic records and behaviors. The company needs to know who worked, when they worked, and who got paid. Employees need to know withholding status, employment dates, and earnings and payroll breakdowns. WFM software helps you maintain and track these important tax-related records. With WFM software, all your answers are right at your fingertips. The employee self-service portal in your WFM software allows employees to view their personal records. Employees can manage their own enrollments, change withholding status, and review historical data. All from a secure and private portal in real time. Employees can provide quick answers to tax preparers. Everything they need to file their taxes is at their fingertips; accurate and up to date. Employers can focus on more important tasks knowing that employees have access. Employees can solve problems on their own without turning to management resources for answers. The chances of your company experiencing an audit are slim. Still, the risk of an audit is enough to keep a small business owner up at night. Workforce management software can help protect you from an audit. In the event of an audit, WFM software has your back with accurate records at your fingertips. For audit protection, WFM software manages your time and attendance with helpful alerts. You’ll be notified when your employees are at risk of unplanned overtime. You can also set alerts to warn you to file reports and check tax opportunities. Alerts are helpful during the year when you aren’t thinking about tax preparation but should be. WFM software will also help protect against an audit with payroll integration. Payroll mistakes and missing data are audit triggers. Your best defense against an audit is to be prepared in advance. Payroll Integration means there are fewer transposing errors to worry about. Accurate time and attendance mean things like rounding errors aren’t introduced into payroll. These kinds of errors may raise an alarm for an audit. Workforce management software can help you avoid these red flags. WFM software will also save you a lot of time in preparation panic. Audit records are at the ready, so you won’t have to scramble to find and organize old records. With WFM software, you are always prepared for tax season.